Official inauguration of exhibitions at the 3 venues in the presence of H.S.H. 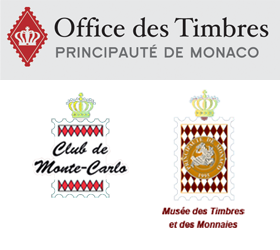 Prince Albert II and the highest authorities from Monaco. (on invitation only). The Musée des Timbres et des Monnaies will host an exhibition of "100 of the World's most iconic Stamps and Philatelic Documents", while the Espace Léo Ferré will be the venue for a trade fair with 80 stands allocated to postal administrations and international stamp dealers. At the same time, time two exhibitions will be held at the Monaco Top Cars Collection, one focusing on Egypt, the other on Maritime Postal History. The exhibition will be open to everyone from 10 am - 5.30 pm. Presentation of the Christoph Gaertner Prize. Presentation of the "Editions d'Or" by the Köhler-Corinphila auction company. Gala dinner (black tie required) in the presence of H.S.H. Prince Albert of Monaco.